It does seem a bit odd to be asked to write some ‘historical’ notes about the founding of CITT. After all, we’re not yet twenty years old. Well, I suppose that now makes it older than our youngest… So, here is a brief history of the founding of CITT as seen from the perspective of a member in Toronto who signed some documents, served on the first Board of Directors, and edited CITT’s journal for the first years.
) so we can improve what has been started below. The Canadian Institute for Theatre Technology was formed in 1990, and it was based on the existing Canadian membership of the United States Institute for Theatre Technology (USITT). USITT had been formed in 1960 in New York and had established a national presence and many local sections across the USA and Canada. After some early activity – the USITT National Conference was actually held in Toronto in 1966 – the sections in Canada became inactive, leaving a scattering of individual members across the country. In 1980, a number of members formed the Alberta Section of USITT and held their first Annual Conference in May at the Citadel Theatre. The section started to build its membership over the decade with a variety of workshops and meetings, eventually hosting the USITT Annual Conference in Calgary in 1989. In 1985, the Alberta Section, with the assistance of the University of Calgary, established an electronic mail and conferencing system for theatre production people, and soon made it available to USITT members and theatre professionals everywhere. This was almost a decade before the World Wide Web and Internet Service Providers (ISPs) made the Internet generally available to those outside universities, governments, and large corporations. CallBoard became the electronic communications backbone of USITT, making the Alberta Section a leading force in USITT. CallBoard was also essential to the eventual creation of CITT. By the late 1980s, CallBoard’s virtual community – at that time consisting primarily of technical directors and production managers – linked theatres and theatre schools across the country. We connected to Datapac lines using 300, 1200 or 2400-baud modems and typed a variety of Unix-like commands while staring at 12” monochrome monitors or 9” Mac Classic screens. We answered each other’s technical questions, found sources of esoteric materials, and nurtured this early online community. In 1988, a determined group of people in Toronto revived the moribund Algonquin Section of USITT. The first activity it sponsored was a tour of the Elgin/Winter Garden complex before its full historical renovation. The Elgin had undergone some basic refitting to mount Cats, marking the start of the ‘megamusical’ era in Toronto, while the eerie Winter Garden was still untouched. An ambitious slate of programs were put together, which soon made the Section one of the most active in USITT. The Algonquin Section started to form a real presence in the theatre scene in Ontario, particularly in Toronto, which was already the third-busiest theatre city in the English-speaking world. Back in Alberta, the dream of a Canadian organization had been incubating for some time. The addition of a second functioning Canadian section in Ontario started to make this look feasible. In 1989, Calgary hosted the USITT Annual Conference, the first one held in Canada since the much more modest affair in Toronto in 1966. This made everyone aware of the scope of the theatre scene in Alberta, and the strength of the Section. There was a meeting of Canadian members at this Conference where the formation of a Canadian institute was discussed, an idea that was warmly encouraged by senior members of USITT. A change in the theatrical environment was making the establishment of a distinctly Canadian organization necessary. At this time, Canadian theatre people were entering an era of regulation that we had heretofore escaped. Ask any of the grey hairs around CITT and we can tell you about a time when it was assumed that labour laws, safety regulations and electrical codes did not apply to us; we can tell you tales of practices that would turn your own hair white. This lawless period was coming to an end by the late 1980s, and it was becoming clear that we would have to take a leading role part in the regulatory process ourselves if we did not want to be constricted by irrational and unworkable laws and regulations. A salutary case occurred in Toronto in 1989. After a number of hold-ups using fake guns and the shooting of at least one suspect brandishing a toy weapon, the City of Toronto brought forward a by-law banning replica weapons. Unfortunately, it was worded in such a way that it could make it easier to get a real gun onstage than even a wooden replica. The Algonquin Section rallied the local film and theatre community to make them aware of the threat, and made a presentation to the City Council that resulted in the exemption for replicas used lawfully in film, television and stage productions. While the Ontario USITT members were successful in this case, it led to an understanding that the Alberta USITT members had already come to when they had become involved with official bodies: it would be much easier to be effective in these circumstances if it sounded like we were part of a Canadian organization. The other motivation to create a Canadian institute was the recognition of the difference in the theatrical cultures between the USA and Canada, along with the different political and legal environments, funding models and technical practices (just ask any American crew that has received a road case from Canada closed down with Robertson screws). The membership in the two countries is also very different, with USITT’s membership and institutional strength based in the many large American university theatre departments that offer both undergraduate and graduate degrees. Today, some 70% of USITT’s members hold graduate degrees. In contrast, there are few graduate theatre programs in Canada, and not one in Theatre Production even to this day. While universities and colleges provide a significant portion of the Canadian membership, those working in professional theatres and in related sales and service companies easily outnumber the academic members, and provide a very different balance and focus. Starting in 1989, the board members of the Alberta and Algonquin Sections and other interested members started taking actual steps to create a Canadian institute. Looking back on it, this was a notable Canadian anomaly: an Alberta/Ontario alliance featuring an established outfit from Calgary and Edmonton working with a bunch of upstarts from Toronto. Apart from a number of meetings, there were a lot of forum discussions and emails and files flying back and forth on CallBoard. The directors and executive of USITT also provided a lot of help and encouragement. Formal letters of incorporation were drawn up and shipped across the country for signatures in May of 1990. They were signed by Normand Bouchard, Patricia Christensen and Ken Hewitt in Alberta, and by James Carnrite, Paul Court and Graham Frampton in Toronto. This was approved by the Canadian Department of Consumer and Corporate affairs in July, to take effect on August 1st. We still had to work out a lot of details of how CITT would be run. While we were all USITT members and were going to fulfill essentially the same mandate, we didn’t feel that the American institute necessarily provided appropriate models for a Canadian institute. We decided to get as many members together as possible and hammer out the details in one busy weekend. On the weekend of September 14 and 15, 1990, some seventy members from across the country arrived for the founding conference of the Canadian Institute for Theatre Technology at the Carlton Place Hotel in Toronto. Most of the members had been talking and working together via CallBoard for some time, but were now meeting many of these colleagues and friends face-to-face for the first time – this even applied to some of the signatories of the incorporation documents. This would not be unusual today, but in 1990 this marked CITT as an organization that made exceptional use of electronic communication. This ‘pre-CITT’ conference started to set the tone for the annual conferences to come. There was a ‘backstage’ tour of the Skydome (now the Rogers Centre), a presentation of plans for the new Ballet-Opera House (not the one that was finally opened sixteen years later), and many people went to see The Phantom of the Opera, which was one year into its ten-year Toronto run. There were plenty of unofficial gatherings in bars and restaurants, with various corporate members inaugurating the fine tradition of picking up the tab for lots of these meetings. The basic membership categories were similar to those that exist today, with the exception of the Associate membership, which was soon dropped. Initially, there were two classes of membership: National and International. The International membership was a combined membership in both CITT and USITT and was available for the first decade or so of CITT’s existence. The most significant decision concerning membership – one that departed significantly from the practice of USITT – was the decision that any member of a Regional Section would automatically become a National member of CITT, and any National member would automatically become a member of any existing Regional Section – or would become a member if a new Section were created. The automatic combination of Regional and National memberships has kept the national organization viable. It has also made it much easier to create new Sections in British Columbia, Québec and the Atlantic Provinces once the National memberships in those areas grew to support a Section. Our membership structure reflects the fact that Canadian Theatre people often work in different parts of the country during their careers, and that most members wanted to be part of an organization with a national perspective. It also reflects the role CITT and CallBoard have played in giving us a sense of being part of a Canadian industry. The Finance Committee hammered together the nuts and bolts of a financial structure that would keep the new organization working – and capable of facing an annual audit. This included setting the costs for the various types of membership. All funds would come to the National Office, which would then remit money to the Sections, based on membership. Money would also be sent to USITT for International membership and for USITT publications, which would be bulk shipped to Calgary and then distributed in Canada by CITT. The National Office would be headquartered with the Alberta Section office at the University of Calgary, which was also the home of CallBoard. A suggestion had been made that CITT start with the modest strategy of distributing Sightlines, the USITT journal, with the addition of some Canadian articles. Brasher heads prevailed, and it was decided to create a national journal that would also take over the function of the current newsletters of the Alberta and Algonquin sections. We agreed that many of the articles in the Section newsletters actually addressed topics of national interest. The format of the current Algonquin Section Newsletter would be used, along with its editor. The new publication would have the imaginative title of ‘CITT Newsletter’. The mandate for the Newsletter was to create a printed voice for the members across the country. Letters, articles and opinions were received from all over – usually via CallBoard. Advertising copy was received as graphic files or scanned in. Each issue was edited and laid out in Toronto (in Pagemaker 3 originally) and then the file was sent to the Calgary office for printing and distribution. The first issues were sent via a 1200-baud modem and the file transfer could take six hours – if nothing froze. At a meeting of OISTAT editors from around the world in 1991, they listened open-mouthed to the technical details of our sophisticated operation: most of them were not even using computers for layout at this point. Of course, none of them had the incentive of living in a country where the national highway was 8,000 kilometers long. Computers, software and modems were eventually upgraded. Many people contributed and corporate members supported us with advertising. Five years on, we could claim that 30% of the membership had contributed to at least one issue. In 1994, the Newsletter was reformatted and its name changed to ‘StageWorks’. This eventually became the electronic publication we have today. It’s interesting to note that, even at this first Publications Committee meeting in 1990, the idea of a strictly electronic CITT publication was put forward. At that time, this would have involved making a CallBoard subscription an automatic part of CITT membership (which did not actually happen for another eighteen years). This was not going to happen at that time because not every member had access to a computer or modem (remember, those things that squealed when you connected?) The matter of file format was also a problem, as this was years before the creation of the ubiquitous and platform-independent HTML and PDF file formats. The discussion kept on popping up as graphic interfaces became the standard and Internet access became practically universal. In 2003, the electronic version of StageWorks became available simultaneously with the printed publication, and the print version was finally dropped in 2005. Alberta: Ab O’Neil - William F. White Ltd.
Tim Clinton continued running CallBoard and Paul Court became editor of the CITT Newsletter. The creation of CITT was encouraged and aided by the Board of Directors and Executive of USITT from the beginning, and the two sister organizations have maintained close ties. USITT’s President Donald Shulman and Treasurer Christine Kaiser attended the founding conference in Toronto, and senior members of USITT have been attending CITT Conferences ever since. Normand Bouchard of Calgary has been a senior member of USITT for two decades, was active in founding CITT, and has been the chief liaison between the two Institutes. Initially, all CITT members received USITT’s journal, Sightlines, and an International membership in both organizations existed for a number of years. 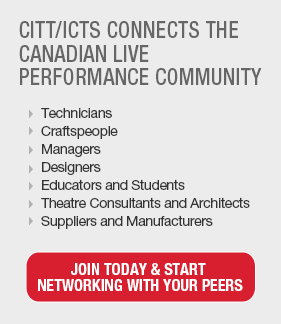 Eventually, CITT stopped distributing USITT publications in Canada and discontinued the International membership as it became simpler for each organization to deal with its own members. Nevertheless, while the ties between the two are no longer quite as obvious as they used to be, many CITT members still find it worthwhile to maintain a membership in USITT as well. The Ontario Section (which is also USITT’s Algonquin Section) played host to two of the largest USITT Annual Conferences and Stage Expos in 1999 and 2005. On November 1st, 1990, all USITT National members in Canada and all members of the Alberta and Algonquin Sections became members of the Canadian Institute for Theatre Technology, “The Canadian Association Serving Design and Production Professionals in the Performing Arts”. CITT took on all membership administration and distribution of publications in Canada. It also took on new members and distributed the first issue of the CITT Newsletter that month. We were off and running. Apart from mentioning people who took on specific functions I did not give much credit to the individuals who did so much work in the beginning and in the early years: I simply feared that I would fail to give all the credit that is due. Nevertheless, from my perspective in Toronto there are two people from Calgary without whom CITT would not have come into existence as soon as it did: Ken Hewitt, our first President, who was the visionary and driving force behind its creation; and Tim Clinton, who developed and ran CallBoard – which became the vital backbone of CITT – from 1985 to July of 2009. Of all the organizations that have provided support, special mention must be made of the University of Calgary, which provided the institutional and logistical base for CallBoard and the early years of CITT.